Lastly, another pair of biker boots! You can never have too many of these! They're so comfortable, and go with everything. I like wearing them all around the seasons. I actually found these in the children's section and I'm so glad they fit! I just bought a long black one from H&M, they are my favorite summer item! I love the way you wore yours with those stunnin boots! wow is that your closet!? all those shoes?! heaven! OHHH! I'M SO IN LOVE WITH LONG SKIRTS!!!! I think that a long skirt could be a great style..or a big mess!!! I T´S UP TO THE STYLE with it! I like the grey pants!! 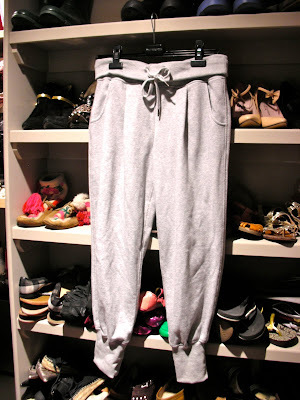 I love those gray sweatpants -- I had no idea that sweats could look so chic! It's my first time on your blog and I love it... Can't wait for more! Great finds! I have a maxi skirt but it's so inconvenient because it has no slit, it's basically a tube and I can only take mini steps in it lol.